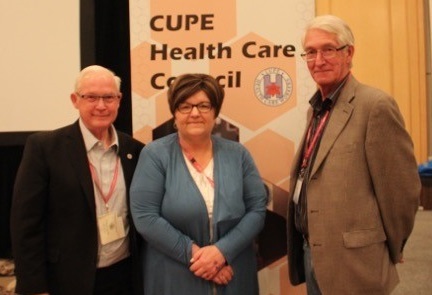 REGINA: Today, delegates at the annual CUPE Health Care Council Conference elected Weyburn resident Sandra Seitz as the new President for the CUPE Saskatchewan Health Care Council. Seitz is the President of CUPE Local 5999, and has been involved with the CUPE Health Care Council since 2003. She started her career as a continuing care aid at Tatagwa View long term care facility. She has been active with the union for 30 years and is passionate about health and safety, tackling workload, and improving public health care for everyone. Seitz is replacing Gordon Campbell, who is retiring after 19 years of service with the council, including the last 12 years as president. Prior to this, Campbell was a long-time activist and President of CUPE Local 3967, representing health service providers working for the Regina Qu’Appelle Health Region. CUPE is the largest health care union in Saskatchewan, representing 14,000 members. We represent a wide range of health care employees in five major classification areas: clerical, technical, nursing, support, and plant operations. Together, we each contribute to the wellbeing of hospital patients, long term care residents, and home care clients.